The Salvation Army deployed two local emergency disaster teams and equipment to assist with the ongoing relief efforts for Hurricane Florence. 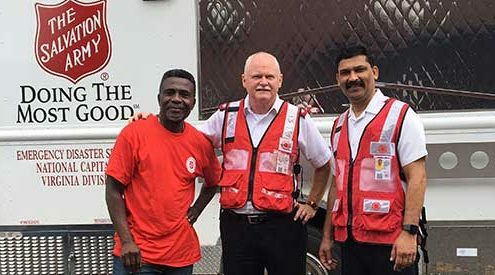 Major Donald Wilson of The Salvation Army Fairfax Corps and Captain Srikant Bhatnagar of The Salvation Army Sherman Avenue Corps were dispatched to Goldsboro, North Carolina, where they will serve first responders and residents from one of The Salvation Army’s emergency disaster canteens. Captain Bobby Carr of The Salvation Army Solomon G. Brown Corps and The Salvation Army FedEx disaster canteen also arrived in Goldsboro, NC, over the weekend. Captain Carr, along with Lt. Alfonso Hughes of The Salvation Army Alexandria Corps, and an emergency disaster volunteer, will serve those affected by Hurricane Florence. Trained emergency disaster personnel are prepared to provide food, hydration, and emotional and spiritual support to survivors and first responders. The Salvation Army disaster canteens can serve 1,500 meals per day. The canteens are stocked with food, water, and snacks. 82 assigned Mobile Feeding Units (Canteens) and 52 in service. The above update is as of September 16, 2018. The best way to support the survivors of Hurricane Florence is by making a financial contribution. This gives relief organizations flexibility to quickly and efficiently meet the immediate needs of disaster survivors without incurring many of the costs associated with sorting, packing, transporting and distributing donated goods. Please designate ‘2018 Hurricane Season – Florence’ on all checks.You can now use ALEXA to donate to The Salvation Army Hurricane Florence Relief. The Salvation Army, established in London in 1865, has been supporting those in need without discrimination for more than 135 years in the U.S. More than 25 million Americans receive assistance from The Salvation Army each year through a range of social services: food for the hungry, relief for disaster victims, assistance for the disabled, outreach to the elderly and ill, clothing and shelter to the homeless, and opportunities for underprivileged children. 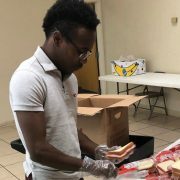 The Salvation Army tracks the level of need across the country with the Human Needs Index (HumanNeedsIndex.org). The Salvation Army has served survivors of every major national disaster since 1900. The Salvation Army does not place an administrative fee on disaster donations. During emergency disasters, 100 percent of designated gifts are used to support specific relief efforts. For more information, go to disaster.salvationarmy.org. Be a Bell Ringer – Volunteer! Thanks for Signing Up as a Volunteer!